Signs and Tokens - A French Fishwoman - The Fishwives of Paris - The Story of a Prestonpans Widow - Psalm John of Whelkholes - Jean Cowie's Story - Fisher Names - Dramatic Sketch -Growth of a Storm - "The Last Scene of All." What a lot o' fisher mannies I see !" It is also considered very offensive to ask fisher-people, whilst on their way to their boats, where they are going to-day; and they do not like to see, considering it unlucky, the impression of a very flat foot upon the sand ; neither, as I have already explained, can they go to work if on leaving their homes in the morning a pig should cross their path. This is considered a particularly unlucky omen, and at once drives them home. Before a storm, it is usually thought, there is some kind of warning vouchsafed to them ; they see, in their mind's eye doubtless, a comrade wafted homeward in a sheet of flame, or the wraith of some one beckons them with solemn gesture landward, as if saying, " Go not upon the waters." At one time when an accident happened from an open boat, and any person was drowned, that boat was never again used, but was laid up high and dry, and allowed to rot away - rather a costly superstition. Then, again, some fisher-people perform a kind of "rite" before going to the herring-fishery, in drinking to a" white lug "-that is, that when they "pree" or examine a corner or lug of their nets, they may find it glitter with the silvery sheen of the fish, a sure sign of a heavy draught. the signs and tokens of the hour as the dwellers in the Square of Fittie, or those who inhabit the fishing quarter of Boulogne. It is a pity that the guide-books say so little about these and similar places. The fishing quarter of Boulogne is not unlike Newhaven: there is the same " ancient and fish-like smell," the same kind of women with very short petticoats, the only difference being that our Scottish fishwives wear comfortable shoes and stockings. We can see too the dripping nets hung up to dry from the windows of the tumble-down-like houses, and the gamins of Boulogne lounge about the gutters, squat on the large side stones, or run up and down the long series of steps, just the same as the fisher-folks' children do at home. It is only, however, by penetrating into the quaint villages situated on the coasts of Normandy and Brittany, that we can gain a knowledge of the manners and customs of those persons who are daily engaged in prosecuting the fisheries. The clergymen of their districts, as may be supposed, have great power over them, and all along the French coast the fisherpeople have churches of their own, and they are constantly praying for "luck," or leaving propitiatory gifts upon the altars, as well as going pilgrimages in order that their wishes may be realised. A dream is thought of such great consequence among these people, that the women will hold a conference, early in the day, in order to its interpretation. Each little village has its storied traditions, many of them of great interest, and some of them very romantic. I can only briefly allude, however,. to. one of these little stories. Some of my readers may have heard of the Bay of the Departed on the coast of Brittany, where, in the dead hour of night, the boatmen are summoned by some unseen power to launch their boats and ferry over to a sacred island the souls of men who had been drowned in the surging waters. The fishermen tell that, on the occasion of those midnight freights, the boat is so crowded with invisible passengers as to sink quite low in the water, and the wails and cries of the shipwrecked are heard as the melancholy voyage progresses. On their arrival at the Island of Sein, invisible beings are said to number the invisible passengers, and the wondering awe-struck crew then return to await the next supernatural summons to boat over the ghosts to the storied isle, which was in long back days the chief haunt of the Druidesses , in Brittany. A similar story may be heard at Guildo on the same coast. Small skiffs, phantom ones it is currently believed, may be seen when the moon is bright darting out from under the castle cliffs, manned by phantom figures, ferrying over the treacherous sands the spirits whose bodies lie engulphed in the neighbourhood. Not one of the native population, so strong is the dread of the scene, will pass the spot after nightfall, and strange stories are told of phantom lights and woful demons that lure the unsuspecting wayfarer to a treacherous death. The Parisian fishwives are clean and buxom women, like their sisters of Newhaven, and they are quite as celebrated if not so picturesque in their costume. About a century and a half ago-and I need not go further back-there were a great number of fishwives in Paris, there being not less than 4000 oyster-women, who pursued their business with much dexterity, and were able to cheat their customers as well, if not better, than any modern fishwife. One of their best tricks was to swallow many of the finest oysters under the pretence of their not being fresh. Among the Parisian fishwives of the last century we are able to pick out Madame Picard, who was famed for her poetical talent, and was personally known to many of the eminent Frenchmen of the last century. Her poems were collected and published in a little volume, and ultimately by marriage this fishwife became a lady, having married a very wealthy silk merchant. The fishwives of Paris have long been historical: they have figured prominently in all the great events connected with the history of that city. Deputations from these market-women, gorgeously dressed in silk and lace, and bedecked with diamonds and other precious stones, frequently took part in public affairs. Mirabeau was a great favourite of the Parisian fishwives ; at his death they attended his funeral and wore mourning for him. These Poissardes took an active part in the revolution of 1789, and did deeds of horror and charity that one has a difficulty in reconciling. It was no uncommon sight, for instance, to see the fishwives carrying about on poles the heads of obnoxious persons who had been murdered by the mob. "His very foot has music in't, As he comes up the stair." But Archibald's feet were never mair till come pap, pappin, in at the door. Twa sorrowfu' and lang lang days passed awa', and the big waves, as if mockin' our sorrow, flang the spars o' the boats up amang the rocks, and there was weepin' and wailin' when we saw them, or in the grand words o' The Book, there was `lamentation and sorrow and woe.' We kent then that we micht look across the sea, but ower the waters would never blink the een that made sunshine around our hearths ; ower the waters would never come the voices that were mair delightfu' than the music o' the simmer winds when the leaves gang dancing till their sang. My story, sir, is dune. I hae nae mair tae tell. Sufficient and suffice it till say, that there was great grief at the Pans-Rachel weepin' for her weans, and wouldna be comforted. The windows were darkened, and the air was heavy wi' sighin' and sabbin'." The following sketches of life and character as seen in Scottish fishing communities may prove of interest to those who are unfamiliar with such scenes. At Whelkholes the great specialty is "the herring." There are curers at the " Holes," and about seventy boats go out during the season to obtain that most abundant fish, which is captured in its season in the immediate vicinity. Great excitement always prevails during the herring season. It is looked forward to as a time of money-making, and much speculation as to whether the season will or will not be a" lucky " one prevails from au early period. Psalm John, the village oracle, has made the herring his peculiar study. He is the authority of Whelkholes on all things pertaining to fishing economy. He tells his brethren when it is time to start for the herring ; he knows full well what signs indicate the appearance of that fish. When he sees the dolphin sporting in the bay or the birds skimming the water, then he knows that herrings are there. For some days before the general launching of the boats for the herring harvest, Psalm John is wont to parade on the high cliff above the village, looking over the water for the expected and ever-welcome herring. Many a weary vigil has been held on that cliff. Many a weary foot has wandered over it during the fierce storms of the spring time, and many a beacon fire has been lighted there, as the women of the village sat at midnight looking across the turbulent sea, questioning with their anxious eyes each rolling billow that broke upon the shore, as to the fate of those afar off on the ravening deep. That cliff was the via dolorosa of Whelkholes. Many a painful tragedy had been witnessed from its pathway ; and it led as well to that last resting-place of the villagers, the churchyard. It was from the pathway on the cliff, one hot autumn night, that Psalm John saw seven corpse-candles move from the village in a weird procession to the cemetery, and his prediction, that a wreck would occur, and that here would be seven corpses, was too surely fulfilled. John always saw a corpse-candle before a death, and all the people of the " Holes " believed in the superstition. The fisher folk, as a body, are great believers in apparitions and wraiths, and whenever a calamity of any kind occurs, there is always some man or woman who was sure it was to take place, as they had seen a funeral procession in the clouds, seven days before, or heard the eerie tick of the death-watch at midnight, or some other admonitory sign. "All people that on earth do dwell,"
broke on the stillness that had hitherto reigned around. One of the women then stood out and addressed the little crowd in an earnest manner, enjoining them to leave off the evil tenor of their ways, and at once seek the path to heaven. From that night there was a striking change in the village ; after that it was no uncommon thing to hear a motley crowd of fishermen, coopers, and herring-gutters, singing a hymn in the curing-yard after they had finished the labours of the day. The revival was a great triumph to Psalm John, for next season the herrings were more abundant in the bay than they had ever before been known to be. The reader is assured that this is a true sketch ; all that is fanciful in it is the name of the village. The revival movement was very general on the shores of the Moray Firth; and although some very inexcusable extravagances were perpetrated, a residue of good has been left behind. "Preaching Cowie" had been left fatherless at the early age of eight years, his father having been drowned in one of those awful storms of the north-east coast, and his boat, with all its dearly, bought fishing gear, lost ; but, in spite of all the disadvantages his son laboured under in consequence, he became at length a comparatively rich man, in the community of Shellbraes. Jean Cowie, his mother, Bull Cowie's widow, had since her bereavement grown a business of her own. She travelled for many years to all the neighbouring towns, both with fresh and cured fish, and only gave up doing so when her well-doing son had become a curer, and when she had herself, by means of her indomitable industry, become in the circumstances a wealthy woman. During the latter years of her life she was a rollicking selfpossessed widow, with a great "gift of the gab." She bought fresh haddocks by the hundred from the fishers, and smoked them yellow in old barrels with smouldering pinewood, then packing up the fish in creels and other baskets, she carried them by rail or cart to market, where she chaffered and bargained, and sold and exchanged, and laughed and joked, or wept, according to her humour, with all whom she met. But those who scanned her countenance in the early years of her widowhood could easily observe the deep furrows that had been worn by the tears in her face. There was a perpetual sadness under Jean's forced gaiety, even when she was in the busy market-place; and where, in the intervals of business, when she could gain a solitary place, she "smoked like mad" to stifle thought and tranquillise her feelings. No one who encountered widow Cowie, as she sallied forth to the nearer towns, would have fancied that during one fatal morning her boy son, her husband, and her father, had all been borne into her house in a melancholy procession, drowned ! They had sailed away the day before to a distant fishing-bank, and while returning home were overtaken by a sudden storm, which dashed their boat upon the rocks within a few yards of the landing-place. There was great lamentation in the village over that calamity, for both Bull Cowie and his wife's father had been favourites in the Braes. Dancing Flucker, her father, had only a few days before he met his own death saved the life of a little child who had fallen into the sea. Thus Jean was suddenly left a widow with four young children ; and when the first keenness of her grief had been somewhat deadened, she felt nerved to work as she had never worked before, for the sake of her young ones-his children. Jean scorned to ask assistance, or to go before "the Board." "Na, na," said the young widow ; "neen o' my bairns 'ill ever hear it said that their mither geed on the parish. 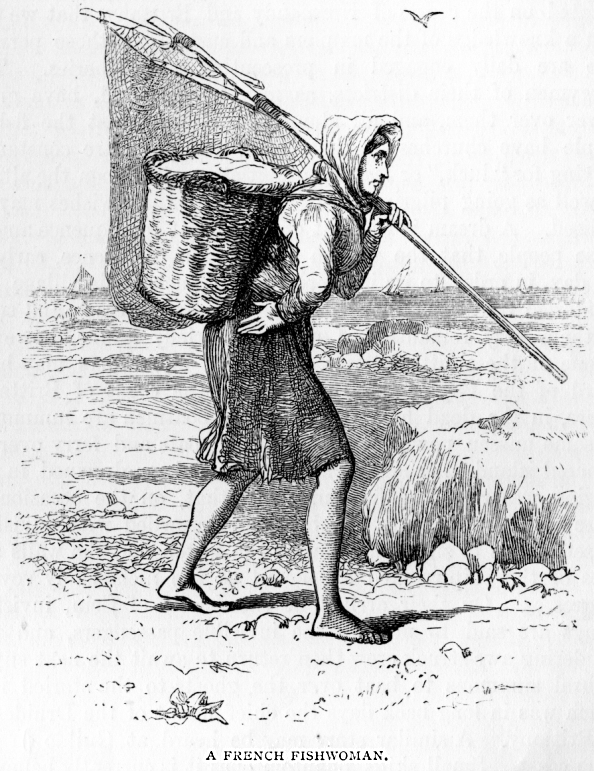 I can work-I can mak' nets or gather mussels, an' there's a kind Providence aboon us a', an' neen that hae hands needs to starve." Like all her countrywomen, Jean Cowie had an abhorrence of receiving parochial relief, or "going on the parish," as the Scottish peasantry call it-even out-door relief is distasteful to them. And as to going into the poor-house, it is looked upon by some of the poorest of the poor as worse than death. Perhaps my readers would like to hear Jean's story as told by herself to a young lady who was buying fish from her. It was as follows:- "What did ye say, mem, saxpence - sax-pence ! Saxpence for they eight bonnie haddies just new oot o' the water, as clean and caller as yersel', mem ! Na, na ; gang till yer flesher, and see what he'll gie for saxpence. They haddies, mem, cost me a clear white shillin' oot o' ma ain hand this mornin', mem, without the word o' a lee ; ay, mem, it's true; but div ye ken what jist sic another creelfu' o' fish as this cost me aince no lang ago? I'll tell ye if ye dinna ken. It cost me a faither, a guidman, an' a son,-yes, a' the three at aince were brocht in till me, stark starin' drooned corpses, wi' the saut sea faim rinnin' frae their hair, and dreepin' frae their claes. Fish, ye see, mem, are no fish, they're lives o' men; an' yet ye wad offer me a saxpence for a' they bonnie haddies ! ye valey men's lives but cheaply, you leddies. Ay, a blithe hale auld chap was my faither. My mither de'ed o' the cholera. An' wha in a' the Braes had a lichter step or a merrier heart than my guidman ? He was nane o' yer skulking men that dread the blast on the tumlin' waves, and wad let their wives an' their weans gang naked an' hungry. Ay, he's faced the angriest sea that ever was seen, an' he could tak a dram or sing a sang wi' the best ; an' as for dancin', he was the best dancer in the Braes ; he was that. An', oh, tae think, mem, o' ma drooned laddie, ma bonnie laddie wi' his hair like lint an' his cheek like rosy aiples, as braw an' soople a son as ever helpit tae trim a sail or cast a net ; he was ma auldest born, an' the ane I loo'ed aboon them a'. Oh ! weary day that brocht me sae mickle grief ; the Lord only can tell hoo I lived through it a' -a faither, a guidman, an' a son, a' drooned at aince, an' a' jist for sic a creelfu' as Sandy Flucker's boat fush in this mornin'. It's fine wather the day, say ye ; ay 'tweel is't, an' the sun nae doot gladdens your heart though it vexes mine. It shines bricht an' bonny i' the noo, but wha kens what it may be afore nicht ? for it was jist a day like this that the three gae'd awa as happy an' as licht o' heart as the wee waves seem'd that lapp'd and kissed the sides o' oor boat as she rocked at the shore, while I stood wi' Jamie in my airms an' Jenny at my feet, watchin' them set oot, an' wishin' them gude speed. Ah, dinna tell me, for I ken hoo clear the sky was, wi' no a cloud tae be seen on't ava, an' the sea wi' jist a bit ripple on its breist that caa'd the boat frae side tae side ; but then a darkness cam an' covered a' the bonny blue lift, an' the thunder, burstin' ower oor hoose, as I sat mendin' my guidman's claes, sent the needle richt intae my hand an' wakened up Jamie in his creddle wi' a skreich ; an' as the lichtnin' flashed in at the window I thocht oil my faither, an' on ma laddie, an' on ma guidman, an' I prayed God help them an' bring them safe hame; safe hame, all 1 they never were tae be that, for the boat was already strugglin' 'gainst the awfu' waves that dash in at our coast-side, an' tryin' tae mak for the landin' place ; then, wives, an' men, an' bairns ran fast, an' gathered on the shore wi' mony a prayer an' cry for help. Wi' Jamie in my airms, I ran as weel, an', kneelin' on the rough stanes, the wind lashin' the water aboot me, an' wi' my bairn held ticht tae ma breast, I cried on Heaven tae save them ; but, O! my leddy, I saw them whirled roon by the waves, an' drooned afore ma vera een. Then what a fecht has been mine sin' syne ! sic loads tae carry, an'. sic weary roads tae tramp ! but there's Ane aboon that keeps us a' richt, an' I'm thankfu' for a' the mercies I hae gotten. Thenk ye, mem ; thenk ye, mem ; but eh, they're cheap at tenpence. Glide day, mem." As I have indicated, Jean prospered in her own way. In the early days of her widowhood, she was up with the lark, she washed for some of her neighbours, she gathered bait, she knitted nets, and nets in those days were made at home of home-spun twine. She also made and mended for the bairns. Meantime her son became an apt scholar, being quick at arithmetic and apt at such learning as was taught by Dominie Brewster in the school of Shellbraes. When the boy reached the age of eleven, he went out in his uncle's boat to the herring, and the season being a productive one, he earned no less than six pounds as his share of the venture. At that time most of the herring boats of Shellbraes were managed on the sharing system, or by " the deal," as it was called. When but a lad, John Cowie went two voyages to the whale fishery, and again earned quite a large sum of money, as his mother said everything he put his hand to was blessed. By and by he became the half proprietor of a herring boat, along with one of his cousins, and so, little by little, his prosperity increased till he became the owner of no less than three fishing-boats, after which he started in business as a curer, and found his industry rewarded with still greater success. Resuming our tour, I may hint to the reader that it is well worth while, by way of variety, to see the fishing population of the various towns on the Moray Firth. Taking the south side as the best point of advantage, it may be safely said that from Gamrie to Portgordon there may be found many studies of character, and bits of land, or rather sea scape, that cannot be found anywhere else. Portsoy, Cullen, Portessie, Buckie, Portgordon, are every one of them places where all the specialties of fisher life may be studied. Buckie, from its size, may be named as a kind of metropolis among these ports; and it differs from some of them inasmuch as it contains, in addition to its fisher-folk, a mercantile population as well. The town is divided and subdivided by means of its natural situation. There is Buckie-east-the-burn, New Buckie, Nether Buckie, Buckiebelow-the-brae, Buckie-aboon-the-brae, and, of course, Buckiewest-the-burn. A curious system of "nicknames" prevails among the fisher-people, and most notably among those on the Moray Firth, and in some of the Scottish weaving villages as well. In all communications with the people their "to" (i.e, additional), or, as the local pronunciation has it, " tee " names, must be used. At a public dinner held at Buckie several of the fishermen were present ; and it was noticeable that the gentlemen of the press were careful, in their reports of the proceedings, to couple with the real names of the men the appellations by which they were best known-as "Mr. Peter Cowie, 'langlegs,' proposed the health, etc." So, upon all occasions of registering births, marriages, or deaths, the " tee" name must be recorded. If a fisherman be summoned to answer in a court of justice, he is called not only by his proper name, but by his nickname as well. In many of the fishing villages, where the population is only a few hundreds, there will not, perhaps, be half-a-dozen surnames, and the whole of the inhabitants, therefore, will be related "throughither," as such intermixture is called in Scotland. The variety of nicknames, therefore, is wonderful, but necessary in order to the identification of the different members of the few families who inhabit the fishing villages. The different divisions of Buckie, for instance, are inhabited by different clans; on the west side of the river or burn there are none but Reids and Stewarts, while on the east side we have only Cowies and Murrays. Cowie is a very common name on the shores of the Moray Firth ; at Whitehills, and other villages, there are many bearing that surname, and to distinguish one from the other, such nicknames as Shavie, Pinchie, Howdie, Doddlies, etc., are employed. In some families the nickname has come to be as hereditary as the surname; and when Shavie senior crosses "that bourne," etc., Shavie junior will still perpetuate the family "tee" name. All kinds of circumstances are indicated by these names-personal blemishes, peculiarities of manner, etc. There is, in consequence, Gley'd Sandy Cowie, Gley'd Sandy Cowie dumpie, and Big Gley'd Sandy Cowie; there is Souples, Goup-the-Lift, Lang-nose, Brandy, Stottie, Hawkie, etc. Every name in church or state is represented -kings, barons, bishops, doctors, parsons, and deacons ; and others, in countless variety, that have neither rhyme nor reason to account for them. As an instance of the many awkward contretemps which occur through the multiplicity of similar names in the northern fishing villages, the following may be recorded :-In a certain town lived two married men, each of them yclept Adam Flucker, and their individuality was preserved by those who knew them entitling them as Fleukie (Flounder) Flucker, and Haddie (Haddock) Flucker. Fleukie was blessed with a large family, with probable increase of the same, and cursed with a wife who ruled him like a despot. Haddie had possessed for many years a treasure of a wife, but prospect of a family there was none. Now these things were unknown to the carrier, who had newly entered on his office. - From the store of an inland town he had received two packages, one for Haddie (a fashionable petticoat of the gaudiest red), and the other for Fleukie (a stout wooden cradle) to supply the place of a similar article worn out by long service. The carrier, in simplicity of ignorance, reversed the destination of the packages, which, of course, were returned to the inland merchant, with threats of vengeance and vows never to patronise his store again. Let the reader take, as an example of the quaint ways and absurd superstitions of the Moray Firth fisher-folk, the following little episode, which took place in the Small-Debt Court at Buckie, at the instance of a man who had been hired to assist at the herring-fishery, and who was pursuing his employer for his wages On the case being called, the pursuer stated that he had been dismissed by the defender from his employment without just cause, indeed without any cause at all ; and the defender, on being asked what he had to say, at once admitted the dismissal, and to the great astonishment of the Sheriff, confessed that he had nothing to assign as a reason for it, except the fact that the pursuer's name was "Ross." "Ye see, my Lord, I did engage him, though I was weel tauld by my neibors that I sudna dee't, and that I cudna expect te hae ony luck wi' him, as it was weel kent that `Ross' was an unlucky name. I thocht this was nonsense, but I ken better noo. He gaed te sea -,vi' us for a week, and I canna say but that he did's wark weel eneuch; but we never gat a scale. Sae the next week I began to think there beet te be something in fat my neibors said; sae upo' the Monday I wadna tak' him oot, and left him ashore, and that very night we had a gran' shot; and ye ken yersel', my Lord, that it wad hae been ower superstishus to keep him after that, and sae I wad hae naething mair to dae wi' him, and pat him aboot's business." The Sheriff was much amused with this novel application of the word "superstitious;" but, in spite of that application he had no difficulty in at once deciding against the defender, with expenses, taking occasion while doing so to read him a severe lecture upon his ignorance and folly, and to declaim, with some vigour, against the many absurd superstitions of the fisher-folk. The lecture, however, has not been of much use, for I have ascertained that the " freit " in question is still as rife as ever, and that there is scarcely an individual among the communities of white-fishers on the Banffshire coast, who, if he can avoid it, will have any transaction with any one bearing the obnoxious name of "Ross." SCENE - A Curer's office. PRESENT - The CURER and the three "Shavies." Curer - Well, Shavie, ye've had a pretty good fishing this year. Shavie senior - Ou ay, it's been geyan gweed. Shavie tertius - Fat did ye say, man? gweed - it's nae been better than last. Curer - Well, laddie, what was wrong with last year's fishing ? Bowed Shavie - Well awat, man, it was naething till brag o', an' fat's mair, I lost my beets at it ; ye'll be gaun till gie's a new pair neist fishin' ? Shavie senior - Ay, that was whan he k-nockit his k-nee again the boat-shore and brak his cweet. Curer - Well, but, lads, what about next fishing ? Shavie senior - Ou, is't neist fishin' ye're wantin' till speak o' ? Curer - Yes ; will you engage? Shavie junior-Fat are ye gaun till offer ? Curer - Same as last. Bowed Shavie - Fat d'ye say, man ? Curer - Fourteen shillings a cran and fifteen pound bounty. Shavie senior - Na na, Maister Cowie ; that winna dee ava, man. Bowed Shavie - We can get mair nor that at Fitehills. Shavie junior - I'll be fuppit, lathie, if I dinna hae mair siller an' mair boonty tee. Curer - Well, make me an offer. Shavie senior - Ou ay, man ; we'll tak' saxteen shillin' the cran an' a boonty o' twunty pound, an' a pickle cutch, an a drappie whisky ; an' that's ower little siller. Curer - Well, I suppose I must give it. Bowed Shavie - Gie's oor five shillin' then, an we're fixed wi' you, an' clear o' a' ither body. And so, on the payment of these five shillings by way of arles, the bargain is settled, and the men engaged for the next herring-season. The British fisher-people as a class are very sober and industrious, and they are becoming more intelligent, and, it is to be presumed, less superstitious. The children in the fishing villages are being educated ; and in time, when they grow to man's and woman's estate, they will no doubt influence the fisheries for the better. Many of the seniors are now teetotal, and while at the herring-fishery prefer tea to whisky. The homes of some of the fisher-folks, on the Berwickshire and Northumberland coasts, are clean and tidy, and the proprietors seem to be in possession of a great abundance of good cheer. with questioning eyes, rush wildly about the shore, piercing with their frightened looks the hidden secrets of the subsiding waters; and here and there a manly form, grim and stark and cold, cold in the icy embrace of death, his pale brow bound with wreaths of matted seaweed, gives silent token of the majesty of the storm.